EATON — John Kramer, of Kramer & Kramer Inc., will be retiring from his business within the next year. He has aligned himself with Muncy & Associates to conduct auctions together, allowing Kramer to ease into retirement. Kramer is a licensed auctioneer and real estate broker in Ohio and Indiana. He is a graduate of Eaton High School and The Ohio State University, with a business degree and real estate major. He has an honorable discharge form the U.S. Marine Corps, after serving two years. He is a member of: Ohio Auctioneers Hall of Fame, Dayton Area, Ohio & National Associates of Realtors, Ohio, Indiana & National Auctioneers Association, Preble County Chamber of Commerce, The Ohio State University Alumni, Life Member, Eaton United Methodist Church, Eaton Country Club, and West Alexandria James F. Ryan Veterans American Legion. He is the Past President of the Ohio Auctioneers Association, Past Chairman and nine-year Member of the Ohio Auction Commission, Past Director of the National Auctioneers Association, and Past Member and President of Eaton Community Schools Board of Education. 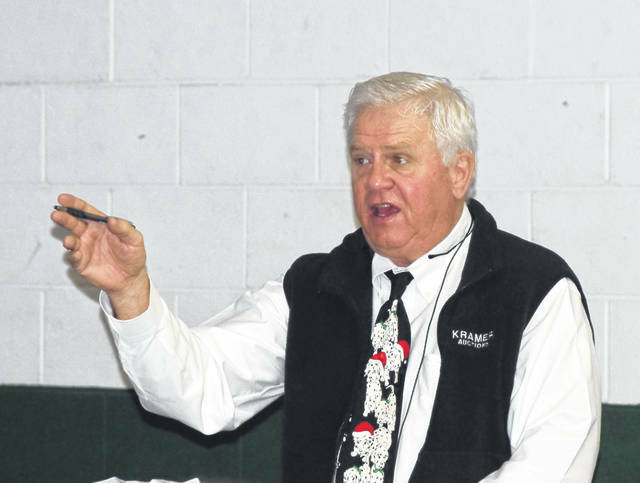 He has served as the Preble County Fair 4-H and Sale of Champion Auctioneer since 1975 and Montgomery County Fair and Sale of Champions Auctioneer since 1982. He has also volunteered with: Ronald McDonald House of Dayton, Ducks Unlimited, Boy Scouts of America, St. Jude Children’s Hospital Memphis, Ron Dixon’s Taj event, Eaton Community Schools Booster Club Events, Preble County Art Association and others. He has been married to the former Debbie Terry for 44 years. Together, they have three daughters. The Kramer family goes back in the Preble County community for more than 100 years. Horace Kramer was one of nine children who seem to have been involved in everything in the county. Kramer & Kramer Inc. dates back to 1910, when Lloyd G. Reitz began his career. In 1948, Horace J. Kramer joined L.G. Reitz in a partnership of Reitz & Kramer, which continued until Reitz’s retirement in 2968. Kramer operated independently until 1973 when John Kramer joined his father in business part-time. In 1975, John Kramer graduated college and joined his father full-time. In 1978, the two formed Kramer & Kramer Inc.
Today, they conduct upwards to 70 auctions annually serving hundreds of clients, employing four full and part-time auctioneers, a full-time auction manager Janet Eby, a full-time bookkeeper, and a dozen part-time clerks and setup personnel. “I grew up watching [my father] and it seemed a natural progression [to join him]. I really had not intended to be an auctioneer. I was a real estate major, but it was the sort of thing where I got the auction bug and that was 45 years ago,” Kramer said. “The dealing with the people always interested me. We have met a lot of different people over the years. Kramer is currently in the process of retiring. He has aligned himself with Muncy & Associates, which allows Kramer to rid himself of many deadlines and requirements. He will begin to refer different jobs to Muncy. Kramer hopes to be out of personal property auctioning within three months. As far as real estate, he may be involved for another six months to a year. Nobody will be taking over Kramer & Kramer Inc., but the business will still exist for the foreseeable future. “We’re ready to back away from the business and the deadlines, pressure, stress of the business. My wife works with me in the office and we’re both ready to do that,” Kramer said. “It is a business of integrity. This is a business that you can’t stand the test of time without ethics and integrity. “That is the reason I went with John Muncy. I’ve known him for a good time, he’s been a friend and a competitor for a lot of years. I trust him. When I was looking at an exit strategy and the assistant auctioneers did not want to take over the business, I knew I had to either flip the switch or align myself with someone else. John Kramer intends to use his retirement to travel to visit his family. While he has no concrete plans at this moment, he is excited by the time it will allot him to do the things he loves, like giving back to the community. “We’re not going anywhere. We’re staying here and I still plan on being involved, in some consulting for auctions and maybe some auction real estate. We haven’t decided, but we will be here,” he said. “I don’t know if I have any plans, but I certainly want to travel to see our family. “We would like to be more active in some volunteer work. I want to play some more golf, I would like to do that quite a bit more. I just want to get away from the stress of the business. I want to enjoy myself a little bit.